Thank you for booking your recent service with BCMC and for taking the time to complete our customer satisfaction survey, which will help us to maintain our high standards and assist with future services. Your feedback is greatly appreciated and as a thank you all completed surveys will receive 10% off their next RV Check up or Service with the BCMC RV Service Centre. The 10% off your next RV Check Up or Service applies to the service aspect (labour) only. Any parts or accessories are charged at standard rates. The 10% off your next RV Check Up or Service is not transferable or redeemable for cash. The 10% off your next RV Check Up or Service applies to vehicles booked in prior to 31st December 2018. Any information you provide will be remain private and confidential and will only be used for the purpose of staff training and improving our company policies. 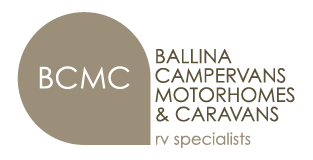 To receive 10% off your next RV Check up or service, please call BCMC on (02) 6681 1007 and quote ‘TY 18’.